Look closely, fill in the missing pieces of the cool grid cancel with a black marker to make it look a little different, add a "PARTIAL GRILL....", reperf the bottom, and voila! Increase the CV by 1200%! 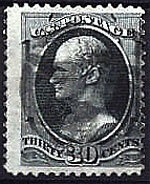 The Scott #143 is quite rare and is usually bought and sold with a certificate of authenticity. 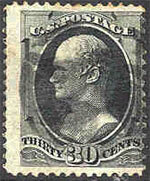 Obviously the seller "schuylerac" again found a rarity in that the original seller missed the grill on the stamp. What are the odds of this happening over and over again. NOT! Once again either "chickfrdstk" or "schuylerac" added a phony grill and damaged another perfectly good stamp. Uuuuggghh! See more of their fake grills here. For those of you into mathematics and statisical probability concerning the odds of these stamps being authentic. Go to Google.com and look up Bayes Theorem and Poisson's Probability Statistics. The stamp on the left was cleaned to remove the paper stains. It has found a new life on the right. 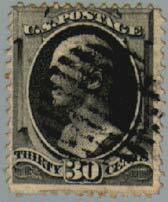 THE STAMP DISPLAYS A PARTIAL STRUCTURED GRILL WITH A SERIES OF GRILL POINTS IN LINEAR ROWS. IT APPEARS REALISTIC. IT CANNOT BE MEASURED FOR DEFINITE VERIFICATION AND AUTHENTICITY AND IT IS SOLD AS IS WITHOUT ANY IMPLICATION MADE OR IMPLIED THAT THIS IS A GENUINE GRILL!! !